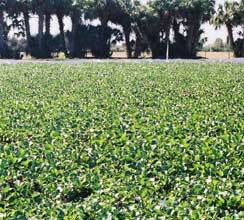 Water hyacinth systems have proven effective in dairy and municipal waste applications for nearly 40 years. HydroMentia’s leadership in hyacinth technology comes with its staff’s nearly 40 years combined experience in the design and operation of commercial water hyacinth systems. HydroMentia’s unique and patented WHS™ design assures its position as a market leader in the development of this sustainable aquatic plant treatment technology.